Boy, you get me started doing Works for Me Wednesday and then there’s no shutting me up! This is one I’ve been wanting to do for a while. I apologize that the majority of readers will probably not find this particularly interesting — but I think that those who do like it will love it. If you have a fear of needles and blood tests, this post is for you. Anyway, after a couple years now of being a regular fixture in the phlebotomy room, I’ve figured out some tips and tricks that make blood tests go much more smoothly. I can honestly say that it doesn’t bother me all the much now. Here are my top four tips. Tons. This is the tip that has made the most difference for me. I learned it the hard way after some difficult, painful draws while I was dehydrated. The liquid part of your blood is 90% water, and chugging water before your test can really improve your blood flow and make everything go better. 3. Request a butterfly needle. Butterfly needles are smaller needles that have rubber tubes in between the needle and the collection vial. These are great not just because the needle is smaller, but because the rubber tube in between the needle and the vial means that when the nurse is, say, fiddling around looking for her cell phone while drawing your blood, the rubber absorbs the motion and the needle doesn’t JIGGLE IN YOUR ARM (not that I have any horrifying memories of this seared into my brain or anything). Butterfly needles are more expensive, so some labs are resistant to using them. In order to get them to go for it you may need to throw in a little melodrama. Explain your fears and see if you can work in a twitch every time you say the word “needle.” That usually does it. 4. Look at a crucifix. One of my initial problems was that blood tests were something completely foreign to me. I was always in good health, so it was easy for me to build up blood tests as the BIGGEST. DEAL. IN. THE. WORLD. It helped to force myself to put the whole thing in perspective and really think about just what an insignificant amount of suffering getting a blood test really is. These days when I feel freaked out I look at the crucifix on a Rosary or a necklace, and it reminds me to unite my suffering with Christ’s and ask him to give me strength. Even when I wasn’t super religious, looking at the heart-wrenching scene depicted on a crucifix really helped me to remember that having a millimeter-wide needle prick you in the arm is just not that big of a deal. Sorry to the readers who were bored to death by this post, but I hope that at least a couple people might find it helpful! For more great tips visit Works for Me Wednesday at Rocks in my Dryer. Bless You, Bless You, Bless You Jen! I am a needle phobe from waaay back. I normally just tell the attending tech or doc, that I need a couch, not a chair and then I’m fine. But these tips are a God-send. The next time I am sent to “the chair”, I will definitely use these tips. I am 16 and have had this phobia ever since I was 4 years old requiring a blood test because my hormone levels were sky-high, I was no scared (didn’t have the phobia) until the lady had to attempt 8 times to get blood; bursting two veins, resulting in me ending up in hospital with a tap-like-contraption connected to my arm. Today I found out I was having a blood test 10mins before walking into the blood taking room and was so terrified. I was crying uncontrollably and the loverly nurse told me that she was going to use a baby needle (butterfly needle), as i was holding my mums had, the blood test took place and it felt like next to nothing. Until today I’d never even heard of a butterfly needle but I am so glad that I have because I think it has saved me from being consumed by this irrational phobia. -Thankyou. I’m not a needle phobe…but nobody actually LIKES having blood drawn; so thank you for the tips. I do have one other to add…related to your crucifix tip: when I had some painful IVs put in, I thought of all that my mom has gone through…all the poking and prodding for her open heart surgeries,etc. It puts it in perspective when you think of loved ones undergoing worse. Recently I had to have blood drawn and for whatever reason the blood just didn’t want to flow. The needle was jiggled, and that was pretty uncomfortable, but what was worse was the several-day bruise that developed at the spot. Gah, needles. Where were these tips a week ago? I just had my blood drawn last Thursday, and my 2 year-old just had 5 (FIVE!) tubes of blood drawn this morning. At least we’ll know for next time! I won’t deny it. Needles freak me out! These are pretty good tips. Great tips! I will have to pass them on. An interesting thing about Butterfly needles I learned from a midwifery list I belong to: Butterflies are easier for practitioners to use, too. But for some reason, there is a stigma on them, like if you prefer to use a butterfly to draw, your skills are inferior. Weird, but may help explain why some might give you a hassle about requesting one. Me too! With my constant reproductive endocrinologist visits, being scared of needles is a bad, bad deal. I just don’t look at the needle and have gotten better with time. With nurses I don’t know, I ask for the butterfly – the better ones can do it without. I will definitely try drinking more water though – great idea. I’ve had trouble with dehydration before surgery, when you can’t drink or eat for some time beforehand. I tell a few scary stories (like the time I passed out while someone was giving me an IV), and usually they get the most experienced person to take care of me. It’s worth a little drama! Oh, yes! As a fellow-clotting-disorder person, I hear you! And warming up your arms helps too. After several dozen frustrating experiences at the Blood Draw, now when they see me come in, they bring out the heated blankets to wrap my arm in before they try a stick. 🙂 Then, I try to imagine that it will be the most horrible pain that I have ever experienced in my life, and hope to be “pleasantly” surprised when it is not. I am lucky to not have any needle phobias but my veins are hard to find. I’ve actually had veins collapsed by technicians who had trouble. The dehydration thing is excellent advice. I had a very miserable experience last summer when I was pregnant with my son because I was dehydrated. Thank you for the tips! Baby Clare had to have frequent Bilirubin level checks right after she was born–and her poor poor little feet! The first couple times they had to squeeze and squeeze her little heel to fill up that darn paper circle. Then a few days later a different nurse used an instant heating pad on her heel first–WHAT A DIFFERENCE!!! I will always request that heat be applied and make sure baby has been fed sufficiently and frequently before needle sticks from now on. Do they have baby butterfly needles too.. THANK YOU so much! This happened to me just last week–four vaccines and a blood test–and they had to do the test twice because one of my veins broke. ARG! I used to work as a plebotomist, and I promise you the person drawing your blood is also thankful if you drink lots of fluids several hours before you have your blood taken! It used to drive me nuts when people would come into the clinic first thing in the morning for a “fasting” cholesterol level, and their doctor had forgotten to tell them that ITS OK TO DRINK WATER! I have a tendency to faint when poked with needles or seeing other people poked or even hearing people talk about it. The thing that helped me the most was to put ice on my wrists or dip my fingers in ice water. This prevents the fainting every time. Now I have had enough practice that I can have my blood drawn without the ice and can even sit up if the person doing the draw is very good. Thanks for the water tip. That will probably make a big difference for me too. Why don’t they ever tell you these things? Long, long, ago in a state far, far away (Minnesota), I had to get blood drawn often. I found that the only way I could stand it was to keep my eyes firmly fixed on something so that I couldn’t see what they were doing with that needle. The pain is tolerable. The sight freaks me out. P.S. Jennifer, could you do something about your “Jennifer’s Favorite Links” blog? I’d like to comment there occasionally, but I really don’t want to have to get a google ID to do so. Thanks much. Kevin, I made the change on the links blog. I used to be really bothered by needles of any kind, it got a little better after I had mono and had to have blood drawn weekly. The phlebotomist had me do deep breathing and not look at what he was doing and that did help. However, when I really got over it was when I was in the hospital before my daughter was born. They were doing blood draws every other day (I was there for 3 months) and they were changing the IV site every other day as well for 3 weeks. I got so that I could calmly watch them draw my blood, put in an IV, flush the heparin lock. Now needles don’t phase me at all. Sometimes adversity helps. Of course it hasn’t helped you totally yet, but just think about all you get to offer up. I’m not trying to brag (! ), but to treat a chronic medical condition, I get an IV and blood tests every two months. Because I am hard to stick, I sometimes feel like a pincushion! Before this illness, I was a needle-phobe, but for me, what helps is focusing on the health benefit. Wouldn’t failing to get the treatment or the information on health status be worse? Stay warm. If you’re cold, it seems harder to draw blood. Also, if someone misses twice, I ask for someone else to do it. THANKS! 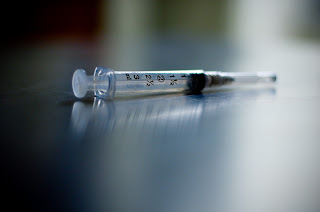 I’ve found it difficult without fainting, to look at needles, to listen to any stories that might include them, even stories about giving birth, for all of my life. I could never watch any health or first aid films in school – always had to leave the room (in humiliation). Perhaps this is because I almost didn’t make it at birth. At any rate, your blog is wonderful – a great gift to us on so many spiritual and mundane levels. God bless you, Jen. Hi, I am new to your blog and came over from somewhere, and I wanted to say this post really helped. I had to go to an emergency room 2 weeks before and the bruises and clotting I have from the blood work is still there. Another thing that I would add is to keep warm. For me, if I am cold, it is much harder. I am SO sorry — I accidentally deleted your comment! That’s what I get for reading through comments while tired. Please know it wasn’t intentional!! Great tips. I have some for giving those darn shots to yourself, and in your stomach no less. I learned that my c-section scar actually serves a purpose, a great place to give myself that shot until my stomach is soooo huge I can’t reach it anymore. Sorry if TMI for those without a blood clotting issue, but for me…finding someone else that has had to do this is priceless! Thank you for these tips! Like some others who commented, I’m more freaked out by the IDEA of a needle, so looking away makes a big difference for me. But I need to try drinking more and warming up too. Am I the only one who can’t even watch someone getting a pretend shot on TV? And a real one, like when the news is reporting on flu vaccine? Totally freaky to me. I have to look away until my husband gives the “all clear”. What a wuss I am. Steph – Am I the only one who can’t even watch someone getting a pretend shot on TV? If you are getting an intramuscular injection it helps to relax the muscle. When I was six, I had to have allergy shots for years. My parents told me it would hurt less if I didn’t tense or struggle, and they offered to give me a quarter for each time I did not fuss or struggle. Since I was saving my pennies to buy Breyer horse models this was a powerful incentive and I learned to selectively relax the area in which the nurse would inject. Another tip for intramuscular or subcutaneous shots comes from a time when I got bitten by a dog and needed a tetanus shot. My pediatrician was on vacation so Mom took me to his substitute. It was just before the start of the school year so the room was full of kids waiting for their shots. Kid after kid was led away, but when they came back none were crying or upset. All said things like “I was really brave! It didn’t hurt a bit!” The doctor’s secret was a tray of ice cubes. He told me to hold the ice cube on my skin until it was numb and then he injected into the numb area. These are all really good tips, wish I had thought of them! What I always found helped me was, well, if you’re expecting your third or fourth or whatever (OK, sixth), you’ve always got little ‘uns in tow when you go to get blood tests. And you certainly can’t leave them out in the waiting room, so they have to come with you to the “chair.” And you can’t very well freak out and scare them about needles, so you have to at least pretend to be calm while the nurse is fiddling around…Now, mind you, my second was a blood-thirsty little barbarian, he probably would’ve enjoyed it if Mom had fainted. its strange but I have the worst ever phobia of needles and blood and pain and can drop anywhere just at the mention of these things. I had my blood drawn today and for the first time has such an easy one. On asking the doc,I learnt about teh butterfly needles, these really are so much nicer than the conventional thing. now my next fear is how to deal with the childbirth, with such fear of all these things, dont think ill ever get past that one. This came up when I googled “blood work tips.” Thank you SO much, also to everyone who commented. I’m 23 and having blood work for the first time in a couple of weeks, and no one else really understands my phobia. Knowing that I’m not alone was a relief in itself, and the tips just made it even better. Thank you, thank you, thank you for this post. Hello, thanks for sharing these great tips about giving blood samples. I was looking for a Internet reference that contained these tips and I found your blog. I cited your blog as a source in a question/answer session on Yahoo!Answers. I hope the person posing the question finds these tips as helpful as I do. I am a professional phlebotomist and I want to correct you on one point. A butterfly is NOT smaller than any other needle. A 21ga butterfly is the same size as a 21ga straight needle. They also increase the risk of your phlebotomist being injured through a needle stick. PLEASE allow your phlebotomist to select the proper tools for drawing your blood. It may be that a Butterfly is necessary but if not then why place them at added risk and increase health care costs by asking for a more expensive tool?